Gaming mouse buttons take a lot of punishment, and that's why the buttons on ROG Spatha feature durable Omron® switches with a 20-million-click lifespan. The exclusive switchable socket design allows for easy customization too. ROG Spatha comes with fully-programmable thumb buttons with Alps® switches to give you tactile feedback. 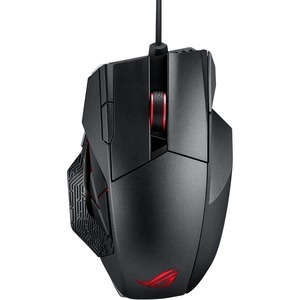 The six buttons are arranged to resemble the iconic ROG eye and are designed to provide intuitive control and feel.